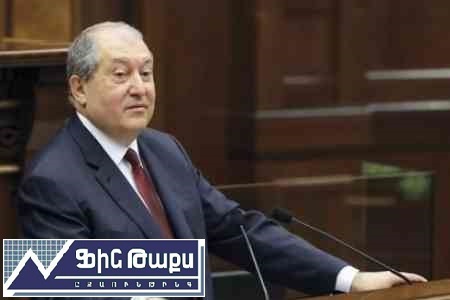 Financing the staff of the President of Armenia in 2019 will be reduced to 1 183 billion drams, Emil Tarasyan, the head of the presidential administration of Armenia, said this during the discussion of the draft budget in the committees of the National Assembly on November 3, presenting the application for 2019. According to Emil Tarasyan, this figure is only 61% of the budget of 2018, or 741 million drams less. According to Tarasyan, cuts are planned in the following areas: salaries and allowances - by 532 million drams, energy services - by 36 million drams. Also, taking into account the fact that the "Airbus" plane, which served the flights of the Armenian President, was removed from the register of the presidential administration, and expenses will also be reduced in this direction. The sum of expenses for automobile fuel also was decreased by about 10 million drams. Chairman of the Standing Committee on State-Legal Issues and Protection of Human Rights of the National Assembly Gevorg Kostanyan noted that such a reduction in expenses is natural, given that the current powers of the President differ from those that existed before. "Undoubtedly, the budget cut should have occurred, since the powers of the president are not comparable at least six months ago and now," said the MP.